Don't miss the 41st Annual Capitol Hill People's Fair- June 2 & 3! 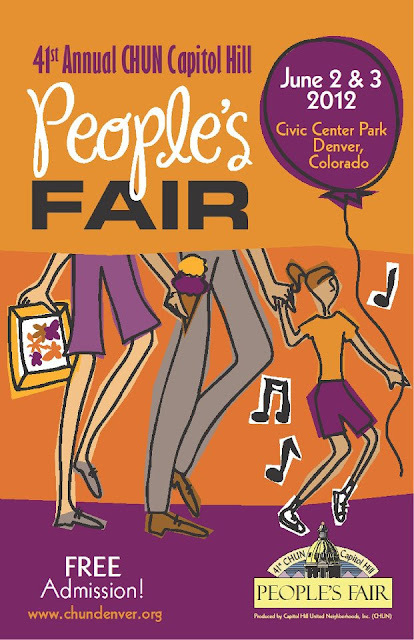 On June 2 and 3, Civic Center Park will once again come alive with the magic of the People's Fair! With FREE admission, the People's Fair offers something for everyone. From festival food fare, to kids and family activities, to six stages with fantastic programming from local entertainers all weekend long- you don't want to miss it! Pick up a People's Fair Passport at any of the fair entrances and have a blast collecting your stamps for a chance to win one of many really cool prizes including two opportunities for beer for a year from sponsor, Miller Lite! The CHUN Capitol Hill People's Fair exists as a celebration of the diverse Denver urban community and its residents. As Colorado's Premier Arts and Crafts Festival, the uniqueness and magic of CHUN's Capitol Hill People's Fair is created by the careful blending of great family fun, carefully selected handmade arts & crafts from over 200 artists, delicious culinary delights, fabulous entertainment featuring 130 bands and performance groups on six different stages, and the commitment to raise funds for and promote the missions of non-profit organizations.